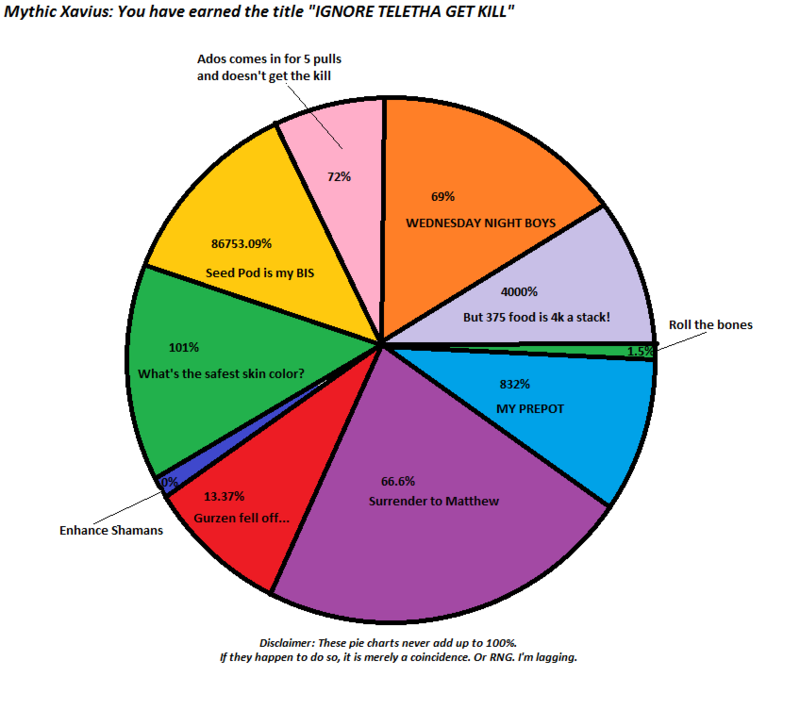 Pie Chart Guild • View topic - And then we doubled it. Home » Board index ‹ Public ‹ News & Announcements ‹ And then we doubled it. It's been a while, but here we are! When I stepped into Emerald Nightmare this tier, it felt really weird. Actually, I felt unlike I've ever felt before. Normally, when you step into a new raid tier - you have this feeling that your character is as ready as it can be and yet that's not how things felt this time around. I felt like my character could be infinitely better and to some of us, that's a good thing whereas to others, it's very unappealing. Taking on these heavy changes to availability of content, people went hard. Really hard. More than I ever imagined they would and for that I am immensely proud of us. As usual, the competition is stiff - the beginning of an expansion marks the return of veterans and guilds reform or increase their commitment to raiding in order to come out on top. For us, we dropped a few ranks in the US-wise but improved our World rankings so kudos to US guilds for that. Lastly shout out to Ariyannah, Dravi, Laugh, Mcrofls, Pikmin, Ducez and Ekyo for their contribution! Re: And then we doubled it. So little impact on the fight that I got mentioned in the people that didn't get to come in. This is a whole new level of Is Dance AFK? Congratulations guys! A solid start to an expansion, agree with what you wrote. Great Pie Chart. Good luck on the next tier!